Condensing yourself into a paragraph is difficult, especially when I'm supposed to be talking about the crazy beautiful life I've been so lucky to have found or that found me as it were. So let's hold off (we can do that later in the game when we Skype or have a Pacifico on the beach) and let's talk about you and your search for a photographer. Take your time and find the photographer whose work screams to you that they are the one who should be documenting your day. At the end of the day it's not about the details or designer names, it's about you and the people you've brought together to celebrate your love. It's the experience and the story. There's magic in them both. I was named one of the 30 Rising Stars of Wedding Photography by Rangefinder magazine, one of the six top destination wedding photographers by Destination Weddings & Honeymoons magazine and have had my work featured in Vogue, Martha Stewart Weddings, Brides, and The Knot magazines along with the regular crew of wedding blogs like Style Me Pretty, Green Weddings Shoes, Once Wed, Snippet & Ink, and 100 Layer Cake. If you think we might be able to make magic together give me a shout. 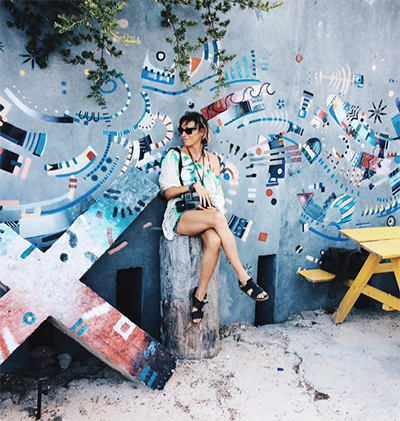 I stayed at three of the hippest hotels in Baja so you don’t have to (but you really, really should). As the plane touched down at the incredibly small and adorable Cabo airport (a quick 2-3 hour flight from basically anywhere in California) and we deplaned on the runway I was immediately greeted by that dry Cabo air. There is barely a tree to be seen and it looks like Joshua Tree in all directions not to mention that the light is insanely beautiful at almost all times of day. We are lucky enough to live in a beautiful part of Mexico on the west coast near Puerto Vallarta, but even we were taken aback by the scenery and general ‘lost in the west’ environment of Baja. It’s like nowhere you’ve ever been even if you are already familiar with the country. We made our way over for our rental car where we were surprised with a nice little upgrade to a lux sedan that made driving around the coast even more fun. Add to that the fact that the roads in Baja are like roads in the US of A (read: good with no potholes) and we were stoked. There’s a new highway from the airport straight into San Jose del Cabo which also takes you on a shortcut bypassing Cabo San Lucas towards Todos Santos and ends up coming in very handy when making the trip from one side to the other. 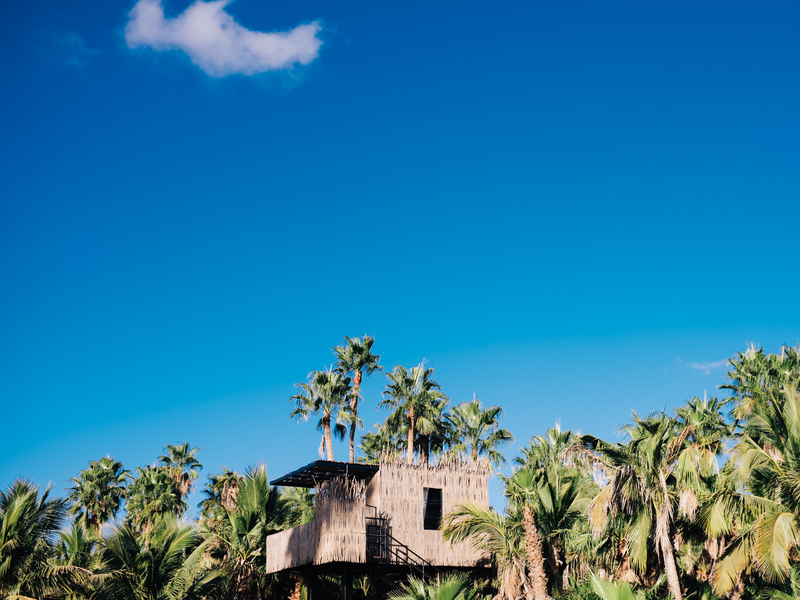 Our first stop was Acre, already well known for their incredible restaurant and now for their newly built treehouses sticking out among the tops of the palms trees in their gorgeous 25 acre piece of paradise just outside of San Jose del Cabo. Out of the three hotels we visited Acre is absolutely the one for the adventure lover and foodie. It was also our immediate favorite mostly because the staff felt like family from the moment we stepped on the grounds, but could also be because they have a menagerie of baby animals from puppies and goats to a tiny baby donkey. As we made our way out to Acre there were times we thought we might have made a wrong turn, but we finally spotted the parking area as we descended towards the property. There are no signs telling you were to go and there is no concierge or bellman hence our suggestion that this is for the adventurous at heart. (We’ll get to the comfort seeking alternative soon.) 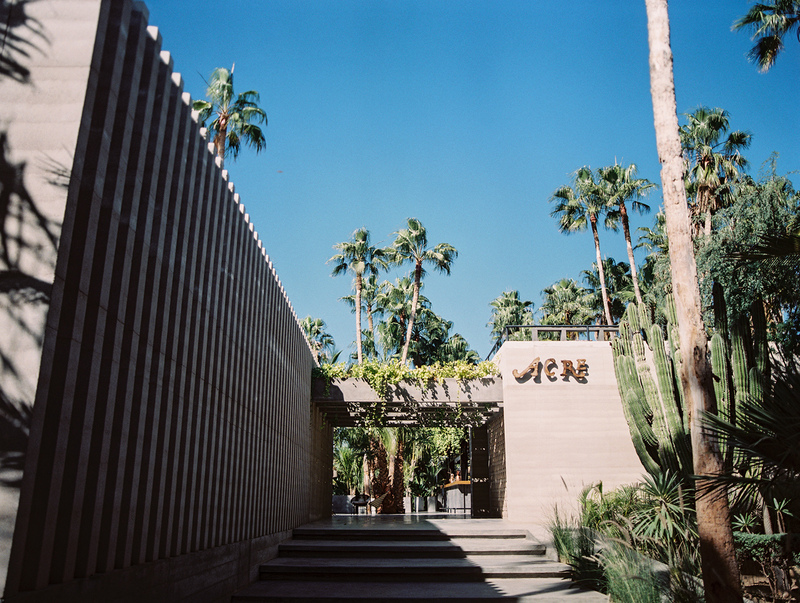 We locked up the car and slowly made our way down a small path through an incredible garden of palms, cacti, and agave passing the various treehouses until we came to the restaurant where we were welcomed with a mezcal cocktail (damn being pregnant) and a minimalist’s design heaven. The main building is made of compressed earth and with it’s living roofs and adobe coloring it blends in perfectly with it’s surroundings. It feels (along with the gorgeous gardens that surround it) as though it’s always been there waiting for you to find. Clockwise from top left: Daily caught fresh fish at Acre restaurant; Poolside cacti; The pool at Acre; Burrito the baby donkey being fed by Rachael the treehouse manager; A selection of cocktails from the resident mixologist; The infamous treehouse; Dreamy tile beside the pool; The game area; Scallop ceviche finished with fresh flowers from the garden. I was starving since that is what I am at all times now so we decided to eat before bringing our things up to the treehouse. The food is undeniably insanely delicious. Almost all of their veggies come from their on site gardens and as much as they can source locally they do. Their fried chicken sammy on a homemade brioche made this ten year transplant to Mexico drool with excitement. The one thing Baja has over us here on the Pacific coast is food. You can’t get anything like that where we live. 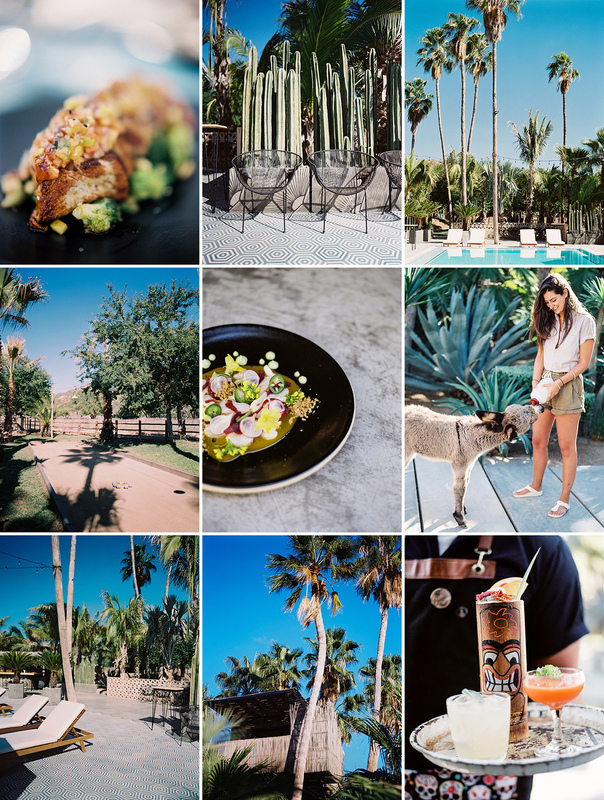 The food revolution in San Jose del Cabo is definitely being televised and more and more people are becoming hip to what an easy weekend getaway this is. Crystal blue water, beautiful weather, and amazing food? What more can you ask for? After we ate we headed up to the treehouse. Thankfully our bags had already been brought up because there is a hefty amount of stairs (I mean it’s a treehouse so that’s expected), but once you reach the top you’re welcomed with your own little cooler of iced down drinks and a Swiss Family Robinson like abode. Clockwise from top left: Afternoon light at the Acre restaurant with just the right amount of misting for when it’s too hot to handle; The s’more desert with homemade marshmallows; Inside of the treehouse; Included with your treehouse stay is breakfast so don’t miss out on the fresh fruit and granola with homemade yogurt sorbet. There was no point in staying inside when we had so much to explore so we set off to town knowing that we would end up at Drift, another small boutique hotel and apparently the place to be on Thursday nights in San Jose del Cabo. Our food journey continued to be exceptional. The Drift food cart churned out the most amazing arrachera grilled cheese while the bar had one of the most extensive mezcal lists I’ve seen on either coast. As we sat at one of the low corner tables near the barbecue smoker the brisket was cooking in we watched as the hippest of the locals arrived along with the odd tourist here and there who knew where to be. The place gets packed around 12 and the dance party goes till late. We spent the next morning roaming around the pool area and meeting the adopted animals including Burrito the most adorable creature you’ve ever seen. Rachael showed us the beautiful patio for weddings and gave me the lowdown on how her father and his best friend came to buy these acres five years ago on a family vacation with little to no experience in running a farm to table restaurant or property of this size. That’s what I think makes this space even more comfortable to be in. Everyone learned along the way and they’re still learning and adapting to their environment. Kevin is the brains and braun of the food operation. He’ll tell you his guys in the kitchen do everything, and they do, but he’s what holds all of that everything together. He is passionate about food and all that comes with it. I don’t think there was a moment when he didn’t ask me if we had eaten and if we hadn’t he forced me to sit and eat before we went any further. It was with an extremely reluctant heard (and stomach since Kevin had just put a pork chop on the grill) that we had to say our goodbyes, but we had to make our way down to the second stop on our whirlwind tour of Baja hotels, The Cape. For the surfers out there The Cape is also poised on a beautiful left hand break so you can wake up at dawn and literally walk to epic waves before coming back in to one of the most insane brunches I’ve ever had. Gustavo (my partner in crime) had never before had an all you can eat brunch (it truly is an American thing) and couldn’t believe that he could just keep going back. That combined with the bloody mary and mimosa bar and he was in heaven. I stuck with my grapefruit juice and watched some of the local kids throw down in the waves before heading down to the salt water pool for a quick dip. My absolute favorite part of the hotel was in the room. Well two of my favorite parts. The first is the tub. Each room is equipped with a huge copper tub and while the might not seem like the most amazing detail to all of you reading, to this 5’10” girl who never fits in any tub in any hotel it was a dream. Each night I drew a bath and entered my own little realm for a bit. A close runner up was the hanging bed on the balcony. Lying down and swinging in the sun with a view of the famous arch was my favorite pastime for 48 hours. Besides the bath of course. I can totally picture a wedding party relaxing to the max before the big event which could take place on the beach, or one of two different terraces, or even the roof top if you’re going for the bigger style wedding with space to fit more than 200+ guests. Our next stop would take us to the other side of the Baja peninsula, but before we left we had to go to the most famous of all Baja restaurants, Flora Farms. Flora Farms is probably the one responsible for the culinary boom that has hit this area with a huge force. They opened their farm in 1996 supplying local restaurants with their delicious vegetable goodness before opening their own restaurant in 2010. I’ve wanted to go to Flora Farms for as long as I can remember. I’m not sure what exactly I was expecting, but I wasn’t expecting the huge enterprise that I encountered. Flora Farms has expanded to include not only the restaurant, but “culinary cottages”, luxury houses set on the hill next to the restaurant, a spa, microbrewery, and juice bar along with a new James Perse store so you can stock up on your organic cotton basics after you eat. I was a little thrown by the grandness of it all when I was only expecting a restaurant, but don’t worry, the food was just as insane as I thought it to be all these years. We finally made our way inside to the completely packed restaurant where Gustavo had what might have been the best michelada either of us had ever tasted (think Bloody Mary, but with beer) with homemade tomato juice fresh from the garden. The lemon ricotta pancakes were probably the best pancakes I’ve had in my 38 years, but the show stopper was the homegrown heirloom tomato salad with homemade burrata and home cured sopresata. Kevin from Acre had let it be known that we should not have come here for brunch as our foray into a Flora Farms culinary experience (truth be told I think any chef would tell you brunch is not a good place to start), but we were tight on time and oh my god they did not disappoint. My mouth is watering just thinking about it. Following lunch/brunch we ventured across the peninsula to the west coast of Baja Sur. The roads stretch for long periods of time and you feel as though you could be in Nevada or New Mexico at times, but just as you think you’ve been driving to long the horizon comes into view you’re at the coast again. We swing by Playa Cerritos on our way to Hotel San Cristobal, our third and final stop on the Baja hotel tour, because we’ve heard it is like a small Baja version of Sayulita, the big surf town just south of us and after a beer at Barracudas, the only small bar in what looks like the entire town, we headed north towards Punta Lobos and the Hotel San Cristobal. Out of the the three, the San Cristobal had been on my list since they opened. I have been a fan of the Bunkhouse group since I found Marfa and their infamous El Cosmico a few years ago and when I heard they were building a hotel in Mexico I was excited for their design savvy amazingness to head south of the border and it didn’t disappoint. The design alone is enough to make you want to stay here forever. The front patio is perfect for a wedding space or if you are more adventurous they also have weddings and events up on the hills in the ruins behind the hotel. Of course you can always beach it, but you can beach it anywhere, where else can you have your big day in ruins surrounded by Baja hills? Clockwise from top left: Walkway to the rooms at the San Cristobal; Nomad Chic boutique in downtown Todos Santos; The pool area at the San Cristobal; The boutique at La Bohemia. Our first stop (or stops) after checking into the San Cristobal were for the famous Baja style fish tacos that the peninsula is famous for. Gustavo and I walked around Todos Santos all afternoon trying different spots and each one was better than the last. Our favorites were El Parguito, where the only thing on the menu are fish or shrimp tacos so don’t bother asking for anything else, and Compa Chava. Both are located in the center of Todos Santos, which is a great town to explore on foot for people of all ages unless you’re the people who decided it was a good idea to walk around in the midday sun in which case it is hot and you are sweating. On our way to El Parguito we snuck into another boutique hotel La Bohemia located off one of the many little side streets where we found, Erin, who along with her husband Andy bought the property on the tale end of their honeymoon in 2014. More importantly we also found my favorite shop of our entire trip. La Bohemia has a small tienda inside its doors with clothing and gifts lovingly curated by Erin from Mexico and beyond that she has found on her travels. She and her sister also began designing recently which is how I am upon my birthday present, an Alpaca wrap made ethically by artisans in Peru and designed by the sisters. Erin and Andy have one of the cutest little spots in downtown Todos Santos and as we were talking she told us about a new space they had to the north of town that they were preparing as a retreat area. We set a time to meet right before sunset and continued on our exploration of the town, but not without a quick stop at to save ourselves from the sun and get Gustavo a michelada and watch the tourists walk by hunched over to save themselves from the sun. We finally made our way out of town and north of the beach in late afternoon as the light was becoming that perfect golden glow photographers wait all day for. I made Gustavo pull over several times to take photos which always makes our trip a bit longer than usual and that in addition to getting lost meant we arrived just as the sun was going down. We pulled into Erin and Andy’s newest space and were greeted with a rustic, yet not too rustic, “glamping” area surrounded by high desert. We sat around the fire pit watching the sky as it slowly changed colors and from there made our way back to the San Cristobal for dinner at Beno where for the second time in two days we ordered the deconstructed cheesecake after the most amazing melt in your mouth short ribs. The next day was our last and I woke up early to take photos of the fisherman launching their boats from the beach a few meters from the San Cristobal and then we made our way north to what was probably the most delicious of all of our meals in Baja. About a half hour north of Todos Santos right on the highway is a little spot, Garrita del Chilpa. We had been told by several locals from San Jose del Cabo through Todos Santos that this was the place to be for the infamous Baja food, machaca. Machaca is dried beef mixed with eggs and is a classic Mexican breakfast food, but I have never had anything like this. Rolled in a flour tortilla with refried beans and served with panela cheese (either grilled or fresh or if you are lucky enough to stop by when the owners are there they will put both on your plate just because) this was one of the most delicious things I’ve ever tasted. We ordered several to go for the plane including one with manta ray (which Gus later said was phenomenal) and reluctantly made our way back across Baja Sur to the airport. « Named a top wedding photographer by Brides magazine.